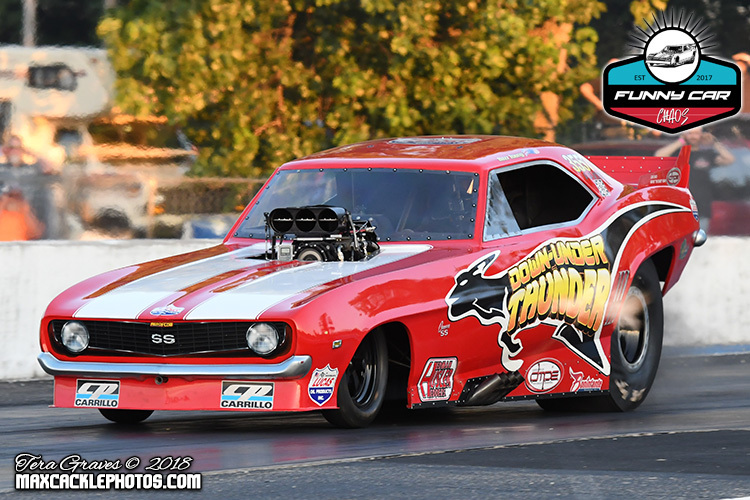 Funny Car Chaos charged into Central Illinois Dragway in Havana, IL on July 27th & 28th for the third of four events on the 2018 tour. After months of anticipation, eager racers and fans were ready for what would soon be dubbed "Chaos in the Cornfield" which certainly lived up to its name. 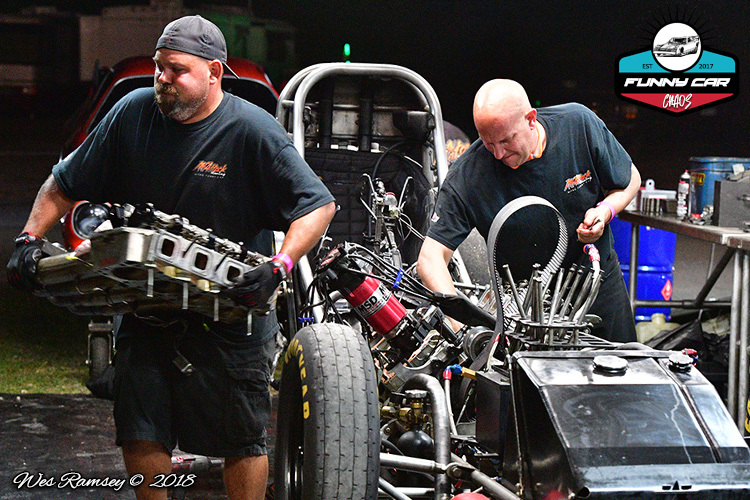 This new and unique rules free approach to funny car racing has caught the attention of flopper teams from across the country and this event welcomed a new crop of racers to experience the chaos for the first time. Several teams towed over 800 miles one way to Central Illinois Dragway, which is nestled deep between thousands of acres of rural corn crops. With 18 cars on the property ready to battle for a spot in the 16 car program with $25,000+ in prize money up for grabs, qualifying got underway on Friday night and brought plenty of excitement under the lights in Havana. 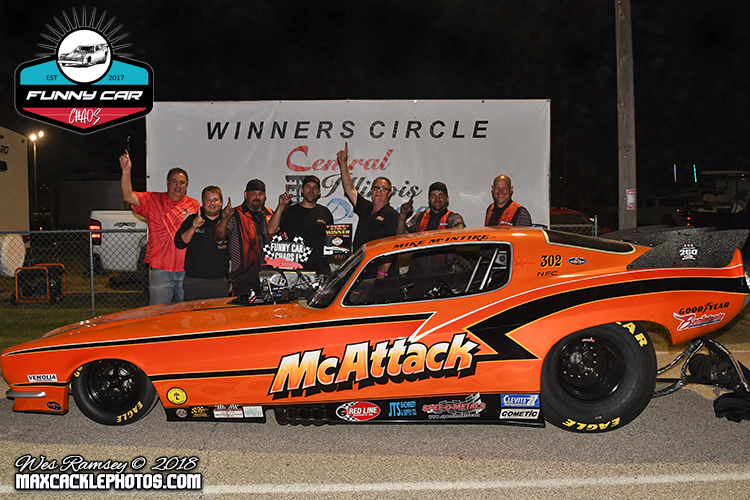 After two sessions of heads up action Mike McIntire Jr and the Ohio based "McAttack" gang led the field with a strong 3.85 at 200 mph. This run marked the first 200+ mph pass by a motor driven vehicle in the track's 49 year history. The crowd went wild as the tow vehicle made its way down to the top end after the historic pass. 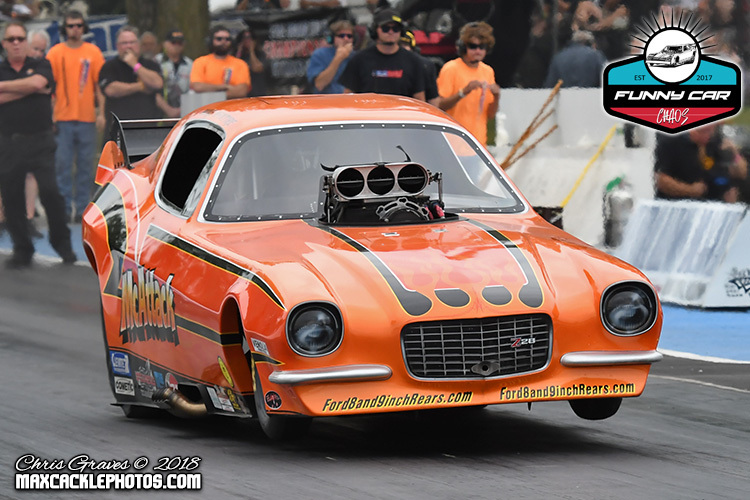 Jim Gifford dipped into the three second zone with a header flaming 3.96 at 166 mph driving Bill Dee's "Nor'Easter" nitro funny car from Brockton, Massachusetts. 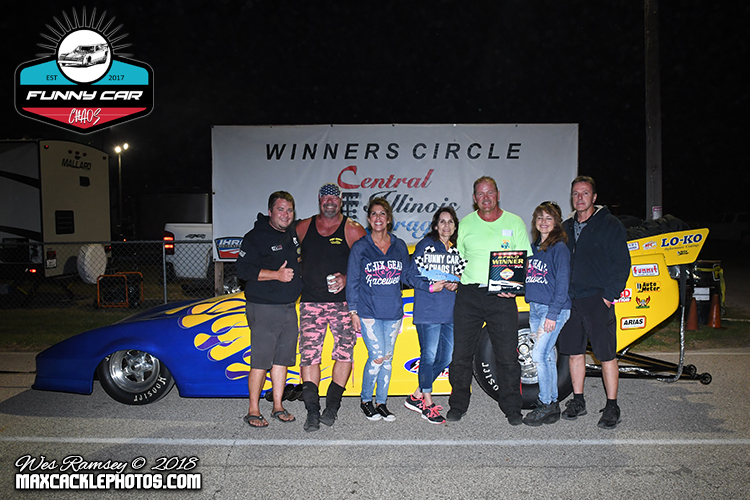 Gifford and Dee won the Dove Farms 'long haul award' with a trip over 1,200 miles one way and this solid Friday night qualifying pass was a great way to start the weekend. Brian Cunningham, Steve Timoszyk and George Reidnauer rounded out the top five qualifiers with one final session available on Saturday afternoon. With some heavy hitters struggling on Friday night and looking to improve their position, the Saturday afternoon session would be an exciting one as the top eight qualifiers would compete in the 'A' field and 9-16 qualifiers would make up the 'B' field. Saturday welcomed great weather conditions as the temperatures were well below normal and consistent cloud cover made for an excellent day for funny car drag racing. 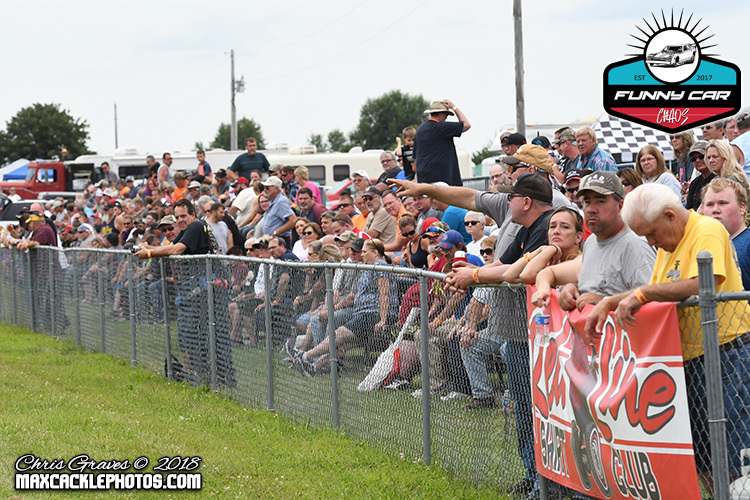 The stands were filling up quickly and by early afternoon there wasn't a seat left in the house as the track bracket program got underway before the 4 p.m. final qualifier for funny cars. As expected, many teams improved their positions as Keith Jackson, Bazz Young and Nick Poloson all put their nitro burners into the 'A' field. George Reidnauer held on to the eighth spot in the 'A' field in his "Excalibur" alcohol burning Corvette with a 4.21 at 164 mph. 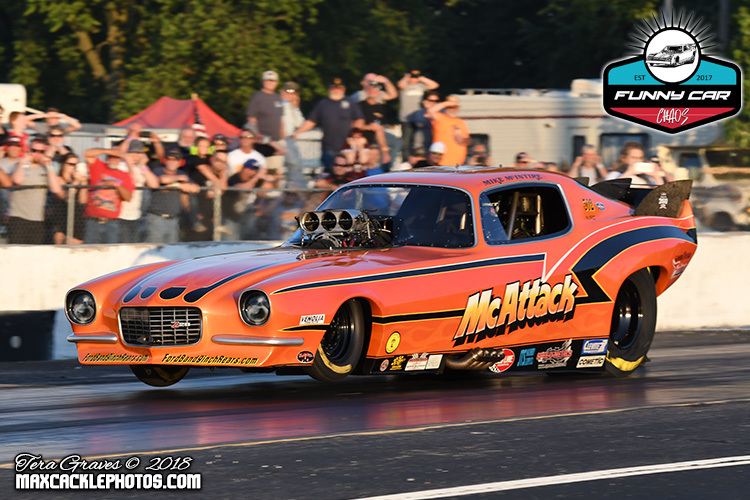 McIntire Jr continued to be the car to watch as he improved his pole position with a stellar 3.77 at 201 mph, the gloves were clearly coming off now! 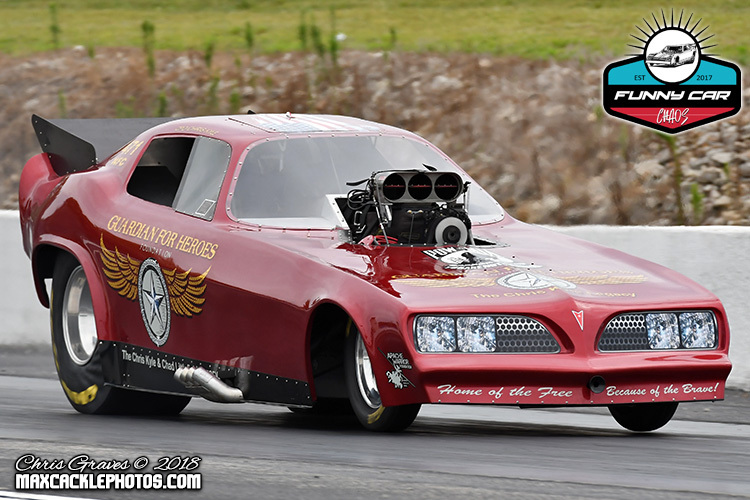 Bill Naves and his North Carolina based top alcohol funny car skipped the second and third qualifiers and were bumped down to the top qualifying spot in the 'B' field with a 4.27 at 147 mph. Jordan Ballew slipped into the final qualifying position in the 'B field with a 4.79 at 124 mph as the "Ballew Thunder" team from Oklahoma made their fourth straight start at Funny Car Chaos. 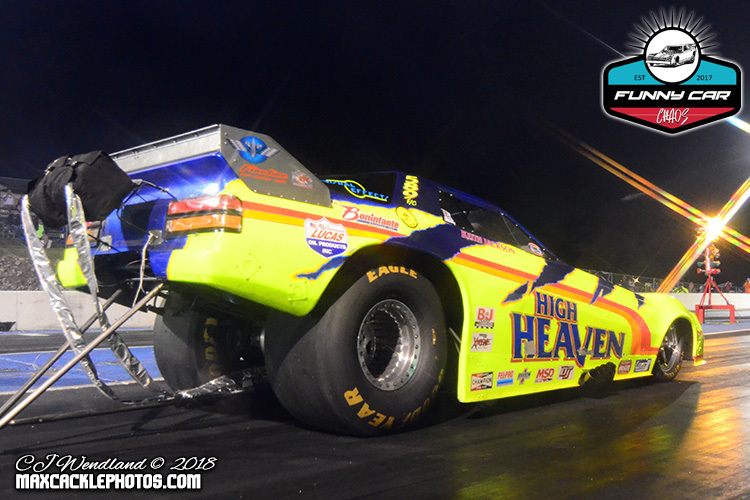 Ballew has attended and qualified at all four events in series history, the only funny car team in the world to do so. Joe Haas driving John Troxel's new "Brutus" and local runner Tim Board came up short of making the sixteen car show. 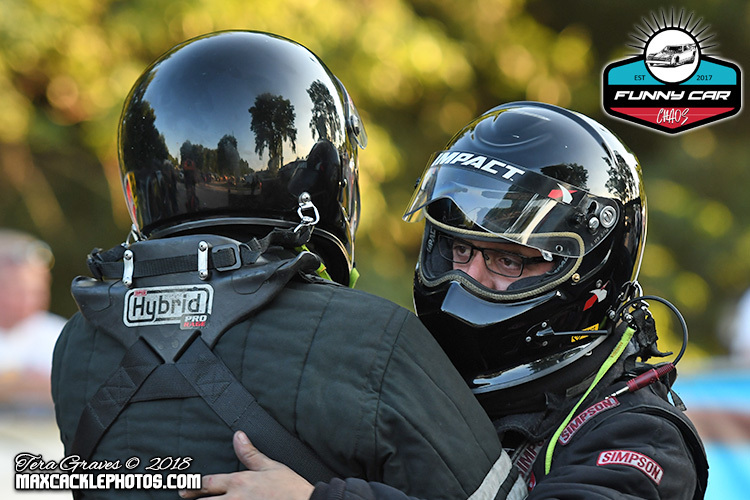 The Haas family with dad Joe and son Joey made a memory that will last forever as the father and son lined up side by side in blown funny cars for the first time in the final qualifying session and just for the record, the kid put a whoopin' on his old man! 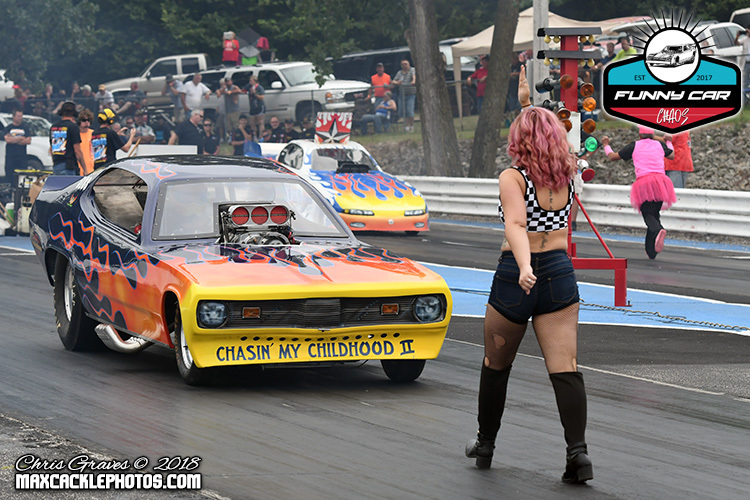 The fields were set and some thrilling matchups were on tap in the opening round of chaos as nitro and alcohol funny cars were ready to unleash their fury and racing for keeps from here on out. 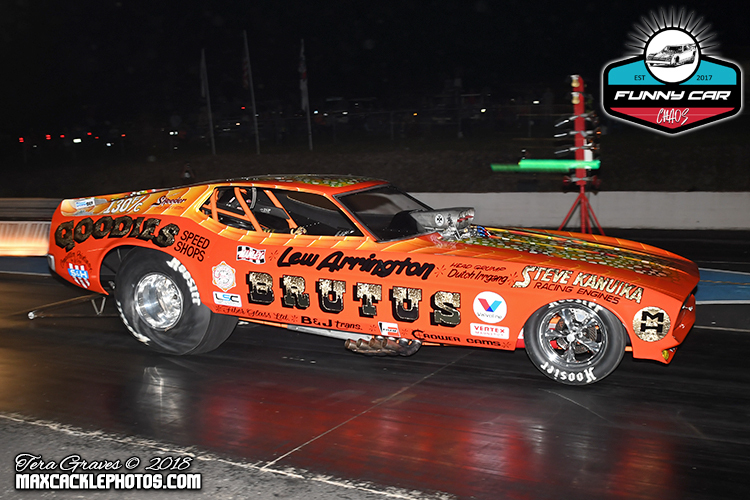 The 'A' field kicked off eliminations and in the first pair things got wild for Keith Jackson's Colorado based "High Heaven" fueler. 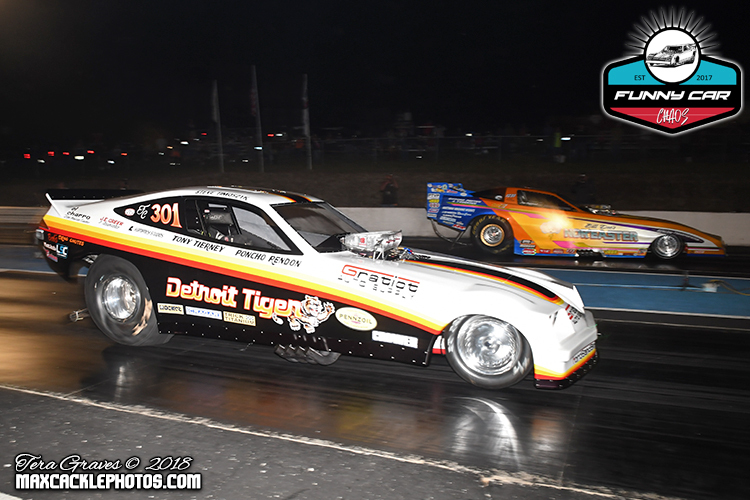 In a fantastic side by side bout with Steve Timoszyk and the "Detroit Tiger", Timoszyk took the holeshot win with a 4.02 at 178 to Jackson's 4.00 at 180 mph. At the top end Jackson had a very late chute and ran out of real estate, nosing the car into the cornfield. Thankfully Jackson and the car were no worse for wear and no damage was reported. 'A' field eliminations continued with top qualifier McIntire Jr taking on Amarillo 'B' field winner Nick Poloson in Gary Doak's "Bucket List" nitro burner from Texas. McIntire kept his string of three second runs alive with a winning 3.85 at 191 mph to Poloson's best lap of the weekend with a 4.14 at 179 mph. 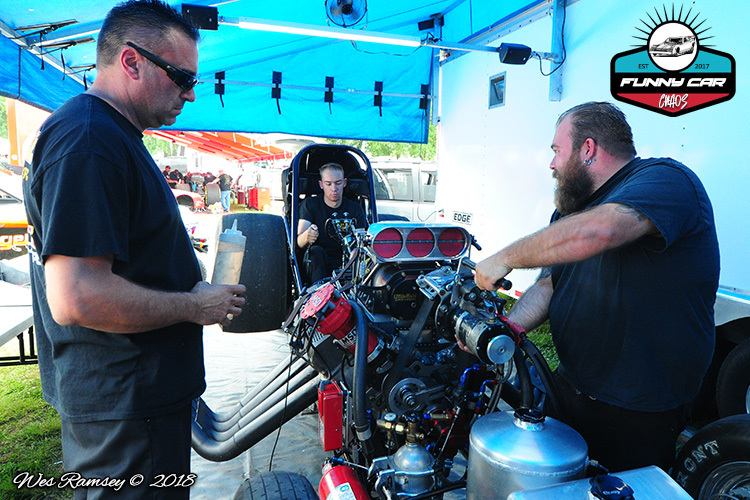 Jim Gifford and Barrie "Bazz" Young pulled their nitro floppers to the line and were side by side through the traps with Gifford's 4.05 taking the win over Young's very close 4.07. The competitive racing continued in the final pair of 'A' field round one as George Reidnauer narrowly defeated Bring Cunningham in a pair of 4.05's. The 'B' field hosted equally exciting competition as Bill Naves started the action with a strong 4.00 at 182 mph to defeat Mark McElwee in the beautiful "Buzzy's Bomber" nitro Nova that posted a 4.39 at 139 mph. 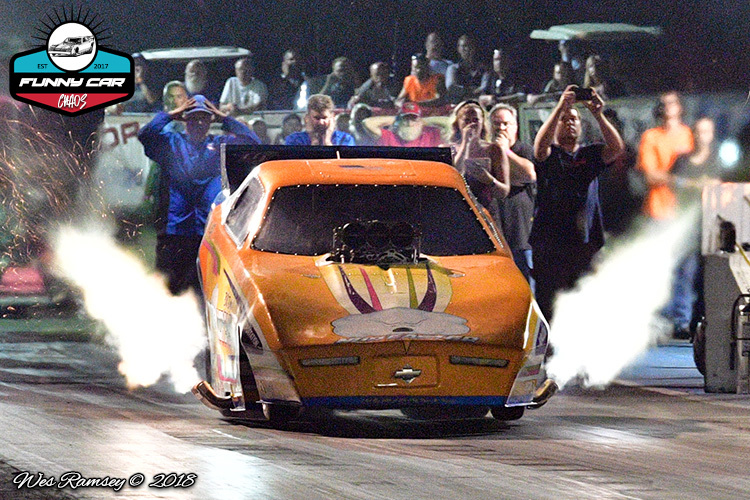 Joey Haas' "Nimrod" pulled off a massive holeshot win with a 4.70 at 146 mph to take out Nancy Matter's 4.51 at 116 mph. This was the competition debut for the Dale Pulde tuned "Guardian" / Chris Kyle Foundation team of Matter and company from Texas as the car showed great potential and will be one to watch in future chaos competition. 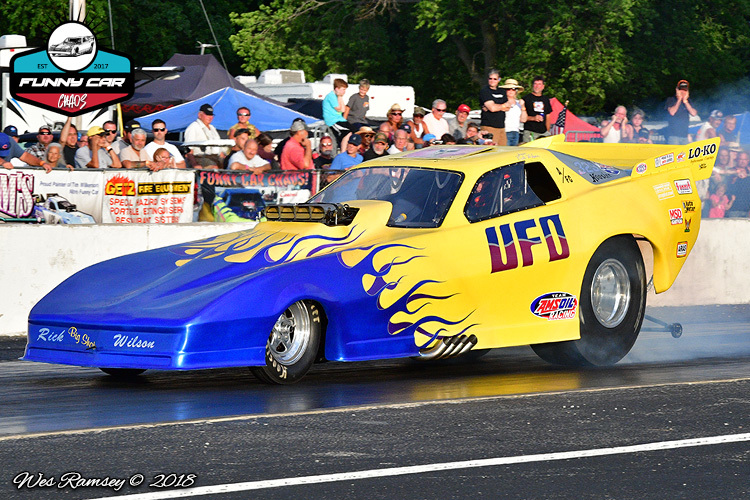 The action continued with Rick Wilson's St. Louis based "UFO" machine taking out Jordan Ballew and in the final pair Mike Kurz's "Chasin' My Childhood" upset John Hale's burst panel launching "One Bad Texan" with a 4.80 to a 4.89. 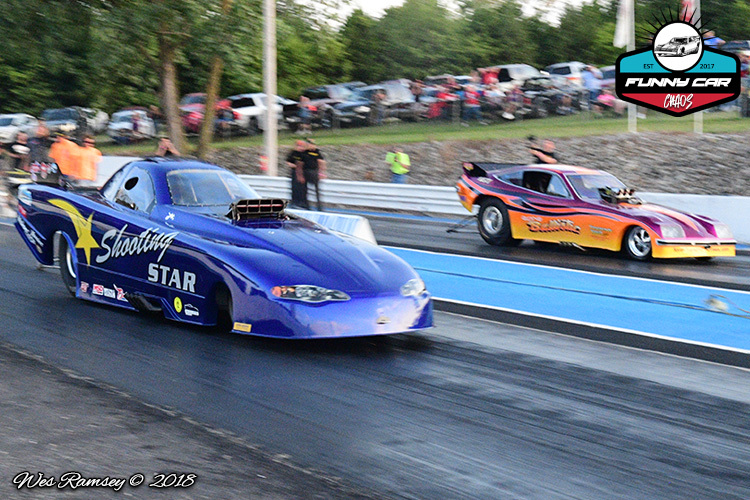 The semi-finals got underway with 'A' field on the line as Steve Timoszyk and Jim Gifford pulled into the beams. 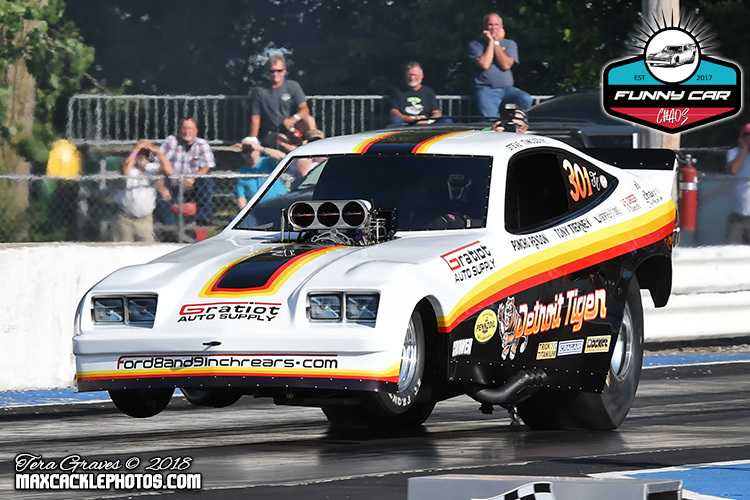 Gifford's car launched with header flames past the roof, but near half-track the car smoked the tires and despite a nice pedal job, Gifford's 4.79 was no match for the Timoszyk's 4.08 at 175 mph as the "Detroit Tiger" team moved into the final round. 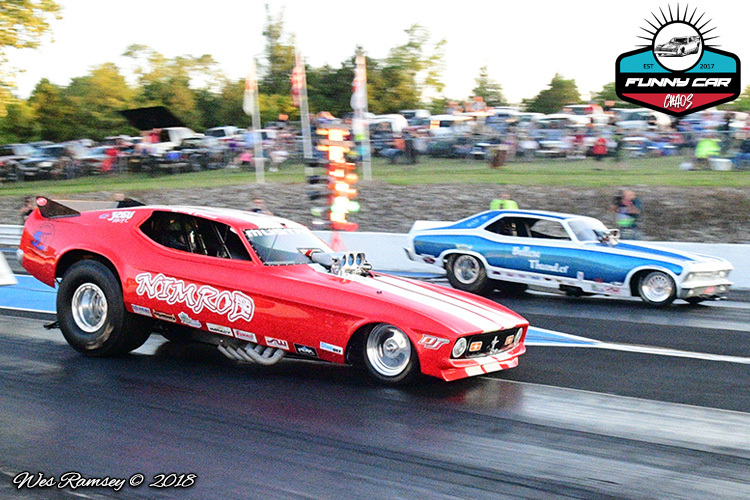 Mike McIntire Jr and George Reidenhaur burned out side by side in the second pair as McIntire showed no mercy with a 3.83 at 199 mph to Reidnauer's 4.34 at 151 mph. It was team "McAttack" and team "Detroit Tiger" final round bound in the Havana 'A' field as the 'B' field semis were up next. Joey Haas and Mike Kurz kicked off the 'B' semis as Kurz rolled through the lights on the starting line and Haas ripped off a 4.62 at 159 mph to advance to the finals at his hometown track. Bill Naves was the favorite as the top qualifier but after his strong 4.00 pass in first round, the team found problems back in the pits which sidelined their efforts prematurely giving Rick Wilson a solo shot into the final where he'd meet young gun Haas in a battle for 'B' field chaos glory. We were guaranteed two first time chaos winners as the call went out to bring em' to the lanes for the final pairs of the night. McIntire Jr & Timoszyk were in a battle for $5,000 to win while Haas and Wilson prepared for a $2,500 to win bout. Haas' fiancée Elizabeth Head backed up her man one last time after winning the "Back Up Girl" contest earlier in the day. The cars staged up and at the flash of amber they were off with Haas taking a huge advantage off the starting line. 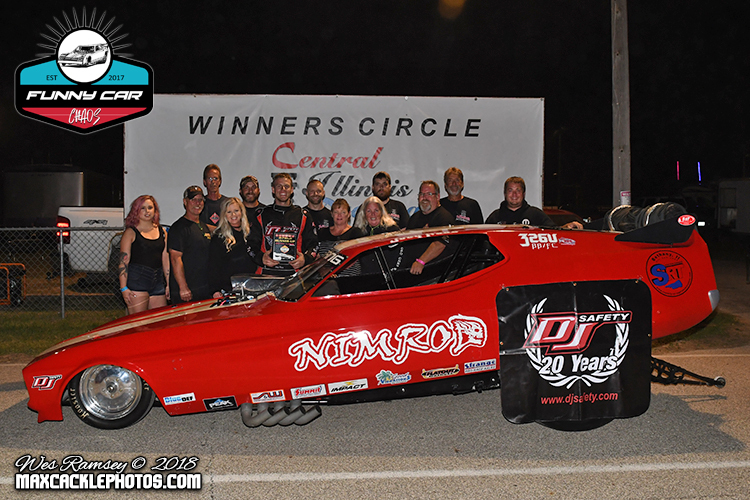 The "Nimrod" posted a 4.60 at 158 mph but it wasn't enough to hold off the hard charging "UFO" funny car that clicked off a winning 4.30 at 159 mph as Rick Wilson and company claimed 'B' field victory and the crew erupted in celebration on the starting line. 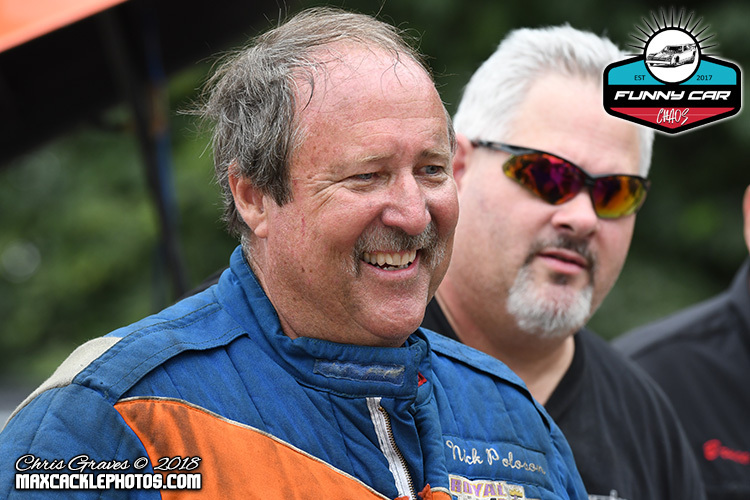 The final pair, the final round, all the marbles in the bag and $5,000 on the line, it was go time for the 'A' field final round between the nitro burner of Mike McIntire Jr and alcohol burner of Steve Timoszyk. Hide blazin' burnouts kicked off the pair as the smoke cleared and the cars crept into the beams. The crew chiefs exchanged nods and send their drivers into the stage position. The cars blasted off the line and both were hooked up and charging hard at half-track. As they neared the stripe, McIntire Jr took the win with a stellar 3.78 at 206 mph as the crew went wild on the starting line. What a performance from the "McAttack" team who swept the competition from top to bottom in Havana. 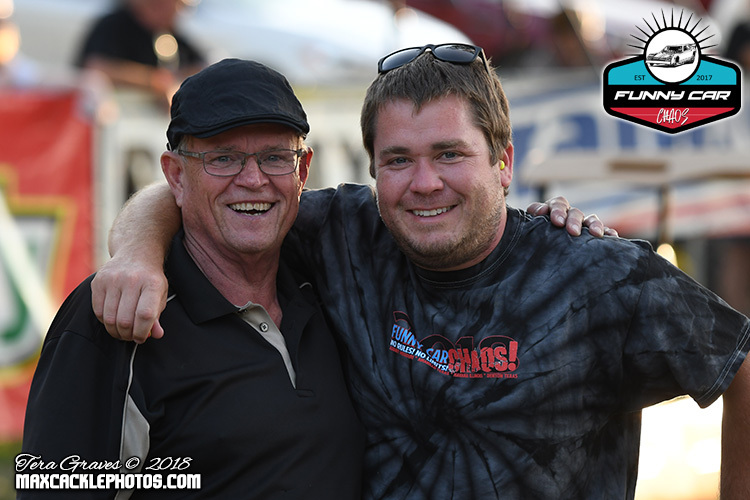 McIntire also took home the $500 low elapsed time cash bonus from Red Line Shirt Club. Congratulations to Timoszyk and company on a strong runner up finish and a big thank you goes out to all eighteen teams on the property who attended "Chaos in the Cornfield". This event was presented by Red Line Shirt Club, Dove Farms, Best of Texas BBQ Sauce, TripleCAgency.com, MaxCaclePhotos.com, DJ Safety, S&W Race Cars, Mears Mazda Volvo and Littlefield Blowers. 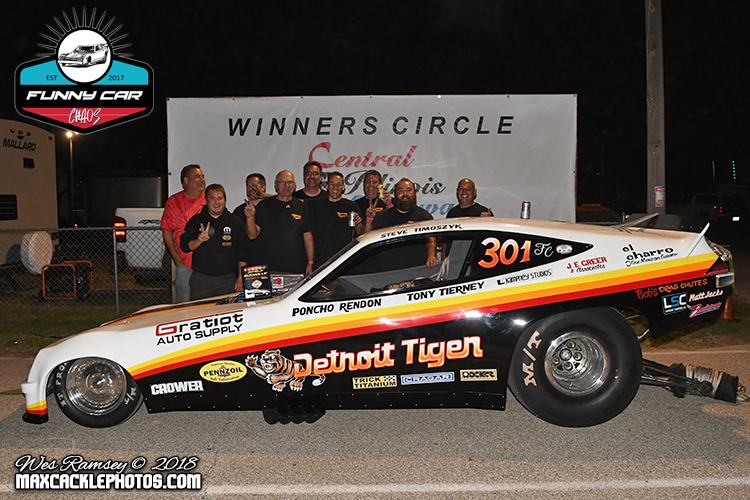 A tip of the hat is due to the entire Funny Car Chaos and Central Illinois Dragway staff on a job well done! Thank you to the fantastic funny car fans who made it out to Havana for one heck of a show. 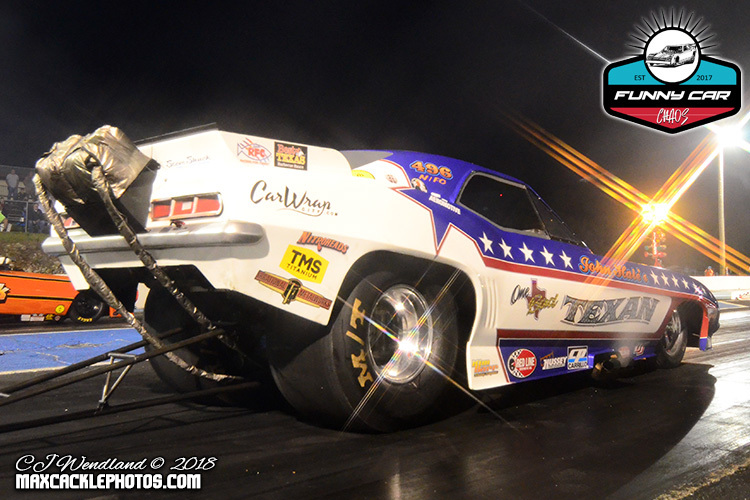 The 2018 Funny Car Chaos tour will conclude at North Star Dragway in Denton, Texas on September 14th & 15th. For more information visit www.funnycarchaos.com.